Bat Feces - An interesting aspect of the relationship between bats and people is how important their droppings have been in many cultures over the centuries, with the high proportion of nitrogen, phosphate and potassium in the substance making it an important fertilizer. Although its importance faded after the development of more chemical fertilizers, the rise of organic farming over recent decades has seen a greater demand for guano again. However, it is also worth reminding people that as well as being useful, bat feces can also be very dangerous, transmitting diseases to people and other animals that come into contact with it, while it can also be difficult to clean too. One of the key ways to identify bat feces is that because the feces is dropped from a roosting point on the roof, the feces will accumulate in piles on the floor of the attic or roof space where the bats are present. The droppings are usually black in color, and when they are found individually they are long thin pellets, but it is the fact that they accumulate in piles that really helps bat feces to stand out. Because bats have a diet that is made up of insects, you will often see that at close quarters the droppings have a shiny and speckled coloring, which is the wings of the insects that aren't broken down fully in the digestive system. If you are going to be examining bat feces at close quarters, or you are going to be cleaning bat droppings or even working to exclude bats from your property, it is vital that you take certain steps to keep yourself safe. The first thing is to wear a mask so that you can be certain you won't inhale any of the spores that are found in these droppings, as in some cases these can cause some very serious diseases. It is also best to have a sealable container or a bag that can be used to hold the droppings if you are removing them, or at least some garbage sacks so that the feces can be double bagged to prevent anyone else from being exposed to the spores. The most common and dangerous disease that is transmitted through the feces is histoplasmosis, which is when spores from the feces are inhaled and cause some severe symptoms and can affect breathing, in some cases even proving fatal if it is left untreated. Symptoms can include a persistent cough or flu like symptoms, and it can be quite difficult to identify for medical professionals as the symptoms are shared with so many other conditions. Henipavirus is another condition that can be transmitted by bat feces, and has been found in Africa, Asia and Australia, although due to flu-like symptoms, most human cases have only been discovered after death. If you are carrying out work to exclude bats from a property, it is very important that you check on the presence of the animals, and one good way of achieving this is to find a pile of bat droppings, and to place a piece of white paper on top of those droppings. You should only do this while wearing the right breathing equipment, but this will give you an indication whether or not the infestation is active or dormant. 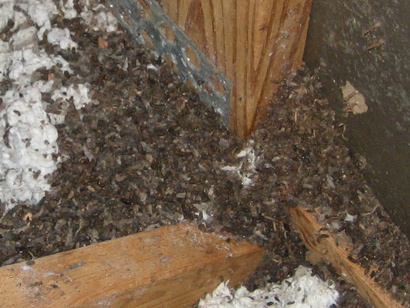 It is easy to disturb piles of guano when you are carrying out exclusion work, while it is also worth bearing in mind that for larger colonies that have been present in the property for some time, the size of the piles of bat droppings may have added weight on to the supporting structure, particularly if this has fallen on an area of false ceiling. This kind of work is certainly not something that you should undertake lightly, as it is not a pleasant job and there are plenty of precautions that you need to take, and in many cases it can be better to hire a professional to carry out the work. As well as removing any loose droppings, in many cases the guano will have become stuck in insulation material or to the beams in a roof area, and to really remove these it can require steps such as removing a layer of the insulation material or scraping it from the wood. Once collected, this should be disposed of safely so that nobody become exposed to the droppings and any airborne spores. As well as cleaning the attic or roof space, you will also need to disinfect the area so that it is safe to access again. This is usually done by a machine that produces a thin mist of disinfectant that kills any remaining bacteria or spores. It is also important to make sure that repairs have been carried out to any entrance or exit holes, to prevent any more bats from entering the space.